her first of three Academy Award-winning roles. At the time, Bergman's marriage was unhappy. Following this, she made several films in Italy away from the glare of publicity before returning to the United States in 1956 to star in the film, Anastasia. One U.S. Senator denounced her as a “powerful influence for evil.” Few people at the time who were not of a similar celebrity status knew how much personal pressure a star such as Bergman experienced. This does not excuse immorality but it does raise important issues: the viewing public demand more and more entertainment from their stars, raising them to such iconic status that few are able to live up to the high expectations placed on them not only to perform but also to live virtuously. The fact that stars live their lives in the full glare of publicity means that their failings become public property, while the lives of those who criticize and denounce remain opaque. 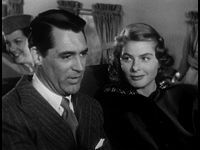 In addition to the significant legacy represented by her films, especially Casablanca, Bergman's biography invites discussion of such issues as the pressures under which stars live, how much of their personal lives should properly be exposed and whether we ought to expect them to act any better than we do ourselves. Is it reasonable to expect athletes and film stars to exemplify moral standards, or are such expectations more fairly demanded of those who actually claim to be moral, who present themselves as models to be imitated? Bergman was born on August 29, 1915, in Stockholm, Sweden. When she was three years old, her mother died. Her father passed away when she was thirteen. She was then sent off to live with an aunt, who died of heart complications only six months later. Ultimately she was raised by another aunt and uncle, who had five children. At 17 years old, Ingrid Bergman auditioned for and was accepted to the Royal Dramatic Theater in Stockholm. During her first summer break, she was hired at a Swedish film studio, which consequently led to her leaving the Royal Dramatic Theater to work in films full time, after having attended for only one year. Her first film role after leaving the Royal Dramatic Theater was a small part in 1935's Munkbrogreven. After a dozen films in Sweden, Bergman was signed by Hollywood producer David O. Selznick to star in the 1939 English language remake of her 1936 Swedish language film, Intermezzo. It was an enormous success and Bergman became a star, described as "Sweden's illustrious gift to Hollywood." Some things that set her apart from other female stars in Hollywood at that time were that she did not change her name, her appearance was entirely natural with little to no makeup, and that she was one of the tallest leading ladies. After completing one last film in Sweden and appearing in three moderately successful films in the United States, Bergman joined Humphrey Bogart in the 1942 classic film Casablanca, which remains her most recognizable role. That same year, she received her first Academy Award nomination for Best Actress for For Whom the Bell Tolls (1943), which was also her first color film. The following year she won the Academy Award for Best Actress for Gaslight (1944). She received a third consecutive nomination for Best Actress with her performance as a nun in The Bells of St. Mary's (1945). Later, she would receive another Best Actress nomination for her portrayal of Joan of Arc in the movie by the same name (1948). It was an independent film produced by Walter Wanger and initially released through RKO, which Bergman had championed since her arrival in Hollywood and which she had previously acted in as a stage play. The film was not a big hit, and received disastrous reviews. It was subsequently shortened of 45 minutes, and it was not until its restoration to full length in 1998 and its 2004 appearance on DVD that later audiences could see it as it was intended to be shown. She also starred in the Alfred Hitchcock films Spellbound (1945), Notorious (1946), and Under Capricorn (1949). Ingrid Bergman went to Alaska during World War II in order to entertain troops. Soon after the war ended, she also went to Europe for the same purpose, where she was able to see the devastation caused by the war. On July 10, 1937, when she was 21 years old, she married a dentist, Petter Lindström. On September 20, 1938, she gave birth to a daughter, Pia Lindström. The marriage ended in divorce. In 1949, Bergman met Italian director Roberto Rossellini in order to make the film Stromboli (1950), after having been a fan of two of his previous films that she had seen while in the United States. The couple married on May 24, 1950, and had one son, Roberto Ingmar Rossellini and twin daughters, Isabella Rossellini, who is a famous actress and model, and Isotta Ingrid Rossellini. Over the next few years, she appeared in several Italian films for Rossellini, including Giovanna d'Arco al rogo (1954), a dramatic oratorio by Arthur Honegger about Joan of Arc. The Rossellini-Bergman marriage ended in divorce on November 7, 1957. Bergman married producer Lars Schmidt, also from Sweden, on December 21, 1958. This marriage ultimately led to divorce in 1975. With her starring role in 1956's Anastasia, Bergman won the Academy Award for Best Actress for a second time. This award was accepted for her by her friend Cary Grant. Bergman alternated between performances in American and European films for the rest of her career and also made occasional appearances in television dramas such as a 1959 production of The Turn of the Screw for Startime for which she won an Emmy Award for Outstanding Single Performance by an actress. She also performed in several stage plays during this time. Bergman received her third Academy Award for her performance in Murder on the Orient Express (1974), but she publicly declared at the Academy Awards telecast that year that the award rightfully belonged to Italian actress Valentina Cortese for Day for Night by concluding her acceptance speech with "Please forgive me, Valentina. I didn't mean to." In 1978, she played in Ingmar Bergman's Höstsonaten (Autumn Sonata) for which she received her seventh Academy Award nomination and made her final performance on the big screen. In the film, Bergman plays a celebrity pianist who returns to Sweden to visit her neglected daughter, played by Liv Ullman. The film was shot in Norway. 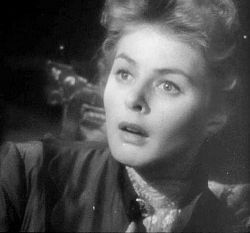 It is considered by many to be among Ingrid's best performances. Bergman died in 1982 on her 67th birthday in London, England, following a long battle with breast cancer. Her body was cremated in Sweden. Most of her ashes were scattered in the sea with the remainder being interred in the Norra begravningsplatsen in Stockholm next to her parents. She was honored posthumously by Ingmar Bergman. In 1980, Bergman's autobiography was published under the title Ingrid Bergman: My Story and was written with the help of Alan Burgess. In the book, Bergman tells about her childhood, her early career, her life during her time in Hollywood, her marriages, and subsequent events. The book was written after her children warned that she would only be known through rumors and interviews if she did not tell her own story. For her contributions to the motion picture industry, Ingrid Bergman has a star on the Hollywood Walk of Fame at 6759 Hollywood Blvd. She continues to be a cultural icon—not only for her role in Casablanca, but for her career as a whole and for her innocent, natural beauty. ↑ Biography, Page 3. 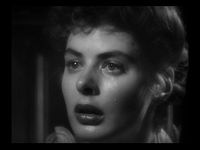 The Official Ingrid Bergman Web Site. Retrieved June 8, 2007. This page was last modified on 3 March 2018, at 17:51.